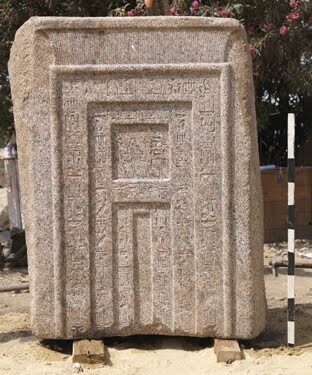 A large red granite false door belongs to the tomb of Queen Hatshepsut’s vizier User and his wife Toy has been unearthed in front of Karnak Temple. 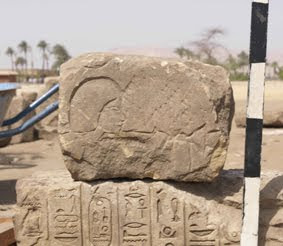 Minister of Culture Farouk Hosni announced the find, adding that this discovery was carried out by an Egyptian excavation team during a routine excavation work. Dr. Zahi Hawass, Secretary General of the Supreme Council of Antiquities (SCA), explained that the door is 175 cm tall, 100 cm wide and 50 cm thick. It is engraved with religious texts, as well as different titles of the vizier User, who took office in the fifth year of Queen Hatshepsut’s reign. His titles included mayor of the city, vizier, and prince. Hawass said that tomb number 61 on Luxor’s west bank belonged to User. Mansour Boraik, Supervisor of Luxor Antiquities and the head of the Egyptian excavation mission, said that the newly discovered door was reused during the Roman period: it was removed from the tomb of User and used in the wall of a Roman structure previously found by the mission. Boraik said that User is the uncle of the well-known vizier Rekhmire, who was King Tuthmosis III’s vizier (1504-1452 BC). A chapel of User was also found in the Silsila mountain quarries in Aswan, which attests to his importance during Hatshepsut’s reign, as well as the importance of the post of vizier in ancient Egypt, especially during the 18th Dynasty. Among the most well-known viziers during this dynasty were Rekhmire and Ramose from the reigns of kings Amenhotep III and Amenhotep IV as well as the military chief Horemheb, who later came to Egypt’s throne as the last king of the 18th Dynasty.